“Jack Strong” is based on the true exploits of Colonel Ryszard Kukliński, Polish Cold War spy and the First Polish Soldier of NATO. 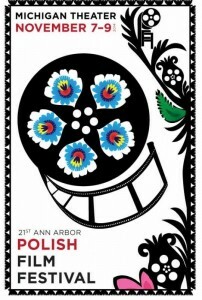 The Ann Arbor Polish Film Festival takes place Friday November 7 through Sunday November 9, 2014 at the Michigan Theatre in Ann Arbor. The 21st Annual Arbor Polish Film Festival has chosen to open another spectacular festival with the 2014 blockbuster spy thriller film “Jack Strong”. The movie, directed by famed Polish director Władysław Pasikowski, tells some of the story of Colonel Ryszard Kukliński and his personal decision to provide critical Soviet military secrets to the CIA over a period of ten years. His courageous actions helped to bring down the Soviet Union and save Poland from potential nuclear disaster as Moscow had devised a war plan to attack and capture parts of Northern Europe using Warsaw Pact Polish soldiers as the spearhead. The Ann Arbor Polish Film Festival is an annual cultural event organized by the Polish Cultural Fund, Ann Arbor, in cooperation with the Polish-American Congress Ann Arbor Chapter, the University of Michigan’s Polish Club, and the University of Michigan. Since its beginning in 1993, the Festival has promoted Polish culture by offering audiences an opportunity to see a broad range of narrative forms and visual styles present in contemporary Polish cinema, including documentaries, animated shorts, and feature film. These works are not only commentaries on life in contemporary Poland, but also reflect the views of Polish artists interpreting diverse issues around the world. The Festival will conclude with an open reception at Amadeus Restaurant, 6:30 pm – 8:30pm. Tickets (per screening): $10 general admission, $6 students and seniors. All films have English subtitles. Program subject to changes without prior notice. “Wladyslaw Pasikowski’s Jack Strong tells the gripping true story of Colonel Ryszard Kuklinski (Marcin Dorocinski), one of the most controversial figures in Polish Post-World War II history. Hailed as a global hero, Kuklinski single-handedly declared and waged a secret war against Communist oppression, risking his and his family’s lives for the sake of national security. Pressured by his own conscience and by an increasing threat of a nuclear holocaust, he realized that the only way to save what’s left of his exhausted country is to go undercover. From a soldier blindly carrying out orders he turned into a spy working for the US government. Communists called him a traitor, Western leaders a direct cause of the collapse of the Soviet Bloc. Even on the verge of death, Kuklinski himself always knew that what he did was right, and after his escape to Washington he claimed that he would’ve done the same thing again. What I admire the most about Pasikowski, as the storyteller, is his unbelievably proper sense of timing. He remains true to his style and always implements the element of suspense with utmost precision. The plot thickens and picks up a pace that’s in perfect unison with the Hitchcock-esque music, which crescendos just in time to create a staggering atmosphere of anxiety. The viewer is always aware of the danger that lurks around every corner. Trapped in a deadly maze of intrigue, Kuklinski soon realizes that his only true allies are the nameless people who try to take control of the situation from the other side of the world. Kuklinski’s overly enthusiastic patriotism is the reason for a great outrage between Soviet officials and, ironically, in the White House as well. The value of the information that he transfers is unquestionable, but after quite some time the situation gets out of hand because of Kuklinski’s inordinate sense of duty. A few mistakes along the way lead to a number of fast-paced, intense scenes (including a breakneck car chase on the snowy streets of Poland, featuring some old-school automobiles) that could embarrass even some James Bond or Jason Bourne films”. The 21st Annual Ann Arbor Polish Film Festival promises to be an event well worth attending with a number of new, varied and exciting films, shorts and documentaries. When you take the time to attend such events you help to keep Polonia alive and vibrant.